he fixed income era now ending could be summed up this way: much lower rates, but much greater size and complexity. A flood of issuance in credit and emerging market debt has greatly expanded the market. New cross-currents created by historic injections of central bank liquidity – as well as by demographics, technology, and regulation – have made it more complex. A transition is under way as monetary policy normalizes, liquidity ebbs, and bouts of volatility are roiling the market. The implications for fixed income investors are significant. As they strive to stay on top of the market transition, most fixed income investors are also keeping a wary eye on geopolitical risks and wondering how much longer an already lengthy economic expansion will last. To state the obvious: they have much to consider. Where should investors focus their attention? What steps can they take to make their portfolios more resilient? We asked four BlackRock CIOs to share their views. 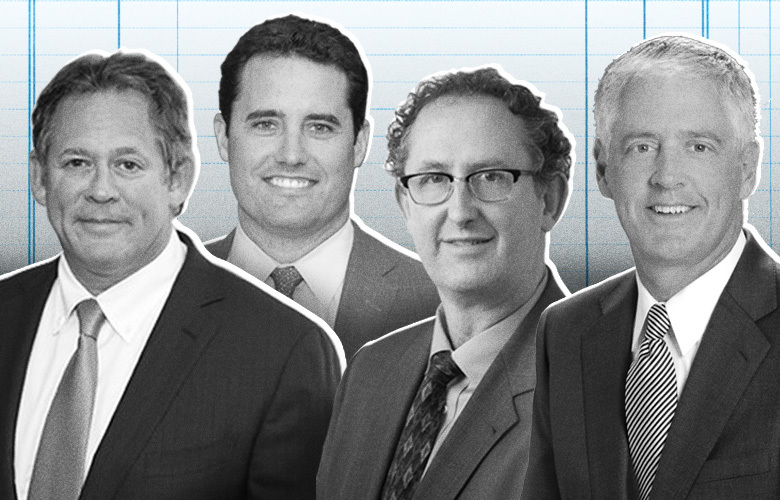 They are (from left to right below) Rick Rieder, Chief Investment Officer of Global Fixed Income; James Keenan, Chief Investment Officer and Global Co-Head of Credit; Tom Parker, Chief Investment Officer of Systematic Fixed Income; and Peter Hayes, Chief Investment Officer and Head of the Municipal Bond Group within Global Fixed Income. Excerpts from their remarks follow. Rick Rieder: I think reduced liquidity is a major contributor to this year’s market stress points. Essentially, central banks are handing off liquidity provision to organic sources. The transition is likely to succeed, but it’s making for a more volatile market because any proactive reduction in the total global liquidity pool impacts a very broad set of economies and asset classes. When Italian bonds sold off last spring after the new populist government was formed, the spike in yields reflected reduced market liquidity as well as structural problems like Italy’s high sovereign debt load and budget difficulties. We’ve seen similar dynamics in bond selloffs in some emerging economies. Understanding the changing liquidity regime probably matters more for investors than headline events such as how many rate hikes the Fed implements. Investors who underestimate the risks surrounding liquidity and who position too aggressively, or in too concentrated a manner, could run into trouble. For building resilience, I’ll cite the important contribution that shorter-end Treasuries can now make to a portfolio. They are offering greater cash flow per unit of risk than other fixed income assets. We continue to think a barbelled portfolio makes sense, with less-risky front-end assets for carry, and some smaller notional contribution from riskier assets. That could mean selected credit or equity, and we also see value presenting itself in some parts of the emerging market debt world. Tom Parker: There’s no question that late-cycle investing presents challenges. The greatest mistake I have seen investors make is accepting too little return for taking on risk. The reach for yield, the power of FOMO – fear of missing out – as well as increasing adverse selection in debt underwriting and the need to put cash to work all push investors into taking on more risk as the cycle ages. The problem is how not to be dependent on timing. To instead create a risk-return profile that pays you to wait as the expansion matures, and has a good upside profile when the cycle weakens. A good way to do this is to use dispersion to your advantage, and to remember that as the cycle advances, dispersion tends to increase. At present, two sources of dispersion can be especially helpful. One is record-high levels of corporate leverage. While interest coverage is generally good, the leverage still makes companies more fragile, and helps separate winners and losers from a credit perspective. The other source of dispersion is the long-running trend of technology disruption, where you see tech-enabled disruptors increasing their productivity advantage over the laggards in sectors such as pharma, media, retail and energy. In systematic fixed income, we use quantitative tools to create predictive insights and devise strategies that benefit from rising levels of dispersion. Peter Hayes: Over the last decade many investors moved outside their comfort zones, taking more duration risk or credit risk than they would in a higher-yield environment. Now it’s time to consider how portfolios might behave as normalization proceeds. In municipal bond portfolios, we recommend moving up in quality. We still see opportunities in lower rated credits, and lower-rated investment grade and high-yield assets still have a role because income is an increasingly important part of the return equation. But these lower-rated credits should be a smaller proportion of the portfolio, and investors need to be more selective. They should also be mindful that the price return has been harvested, and the returns will really be based on the coupon. Hedging duration is another way to build in more resiliency. So is managing risk with a barbell curve emphasizing the short and the long end, as opposed to overweighting the belly of the curve, where negative term-premium unwind will be the greatest as central banks continue to normalize monetary policy. Investors should also be aware of one other major change. Whereas for years, market performance has been largely driven by greater demand than supply and other technical factors, underlying fundamentals will take center stage in the next downturn. Knowing what you own is becoming essential, and understanding all of the risks associated with later-cycle issuance patterns is paramount from both a performance and liquidity standpoint. James Keenan: We expect rising rates to cause tighter liquidity and increase dispersion, which will create opportunities to generate alpha. We recommend positioning for this shift by moving up in quality and reducing duration. This will help to mitigate against unintended, idiosyncratic risks, and interest rate uncertainty. This positioning leads us to leveraged loans and CLOs, which offer the downside protections of floating rates and a senior position in the capital structure. We’re not the only ones interested in these assets, of course. Investor demand has been strong, spreads are tight, and 2018 institutional leveraged loan issuance—which totaled $357 billion as of September 25, according to S&P LCD—may surpass 2017’s record. But both high-yield bonds and leveraged loans have historically performed well in a climate of gradually rising rates, which we expect. Finally, we think it’s important to pay attention to technical factors. We expect supply to be the biggest factor in second half performance. We think increased volatility will be a hallmark of this period of quantitative tightening. There are technical reasons—supply and demand within asset classes, liquidity—and flare-ups of geopolitical risk will be a factor too. We also see investors becoming more attuned to company-specific information, and to idiosyncratic events. This entry was posted in Durig Capital Customer Feedback, Durig Capital Destressed Debt Hedge Fund, Durig Capital Fixed Income, Durig Capital Fixed Income (FX2) complaints and reviews, Durig Fixed Income FX2 on November 29, 2018 by Randy.